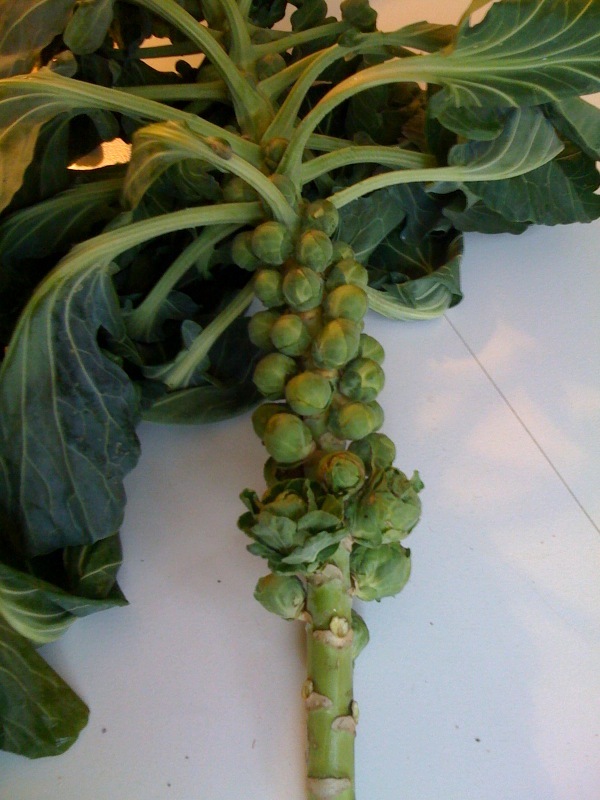 This year I (unsuccessfully) tried to grow brussels sprouts. A friend gave me a few starter plants in May and I LOVE brussels so I was excited about the prospect of including them in my fall harvest. They kept growing all through the summer but never got really big. Then over the holiday I was reading one of my mom’s gardening books and discovered what I did wrong. Apparently once the brussels are about pea sized you’re supposed to snip off the top of the plant so the nutrients goes to the sprouts and not the growing stalk of the plant. So today I happen to be cleaning up after a NYE party and noticed that there were a few decent sized sprouts on them. I pulled two of them out of the ground and brought them in. Now normally if you have typical sized brussels sprouts you can just leave the whole plant like this hanging in your root cellar and pick them off as necessary throughout the winter. 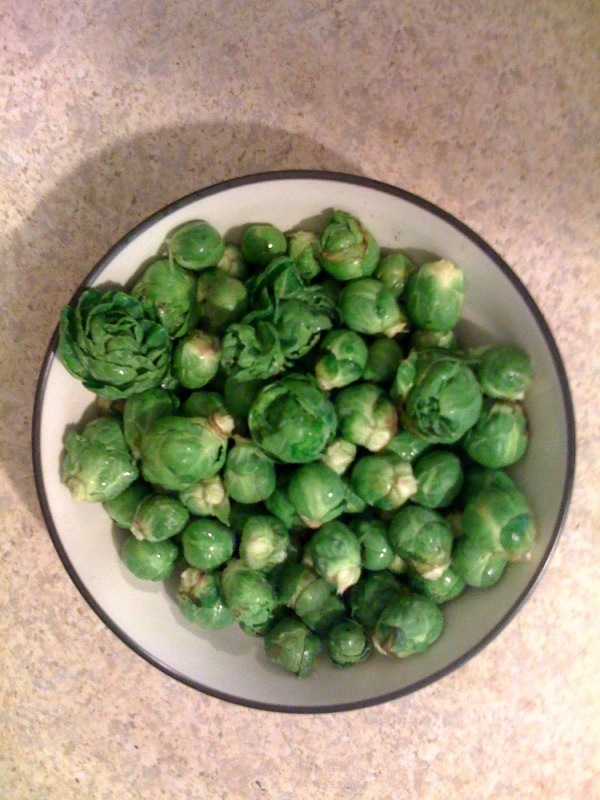 I, however, grew miniature brussels which only amounted to a few dinners worth so I pulled them all off. Because they’re so small I’m assuming they will be really bitter, but hopefully sauteing them for long enough in some butter and herbs should make them a bit more appetizing. I guess we’ll find out later tonight when I make them for dinner! If you have any helpful tips for next year let me know! Entry filed under: My Garden. 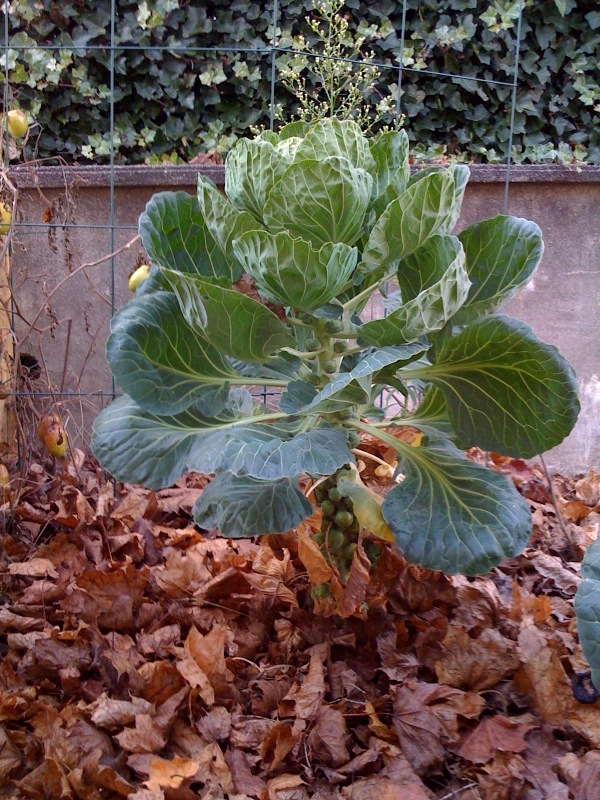 Tags: Brussels Sprouts, Connecticut, Gardening.